The above info came from Elwin Blaine Coldiron, and was edited by yours truly (contact me). The image came from Pretty Sammy Page. Episode one introduces us to the world of Pretty Sammy very effectively. Somewhere far away from the Earth is the magical kingdom of Juraihelm. Tsunami and Ramia are the two candidates for the next leader of the entire kingdom. The council had to decide who would rule next; and, of course, they chose Tsunami, much to Ramia's displeasure. Of course, for Tsunami to be able to ascend to the position, she has to pass a test. She must select another person in another world, grant them magical powers, and help guide them in how to use them to make their world a better place. At this time we are introduced to all of the characters that will make up our world and how they have changed from the other series to this one. 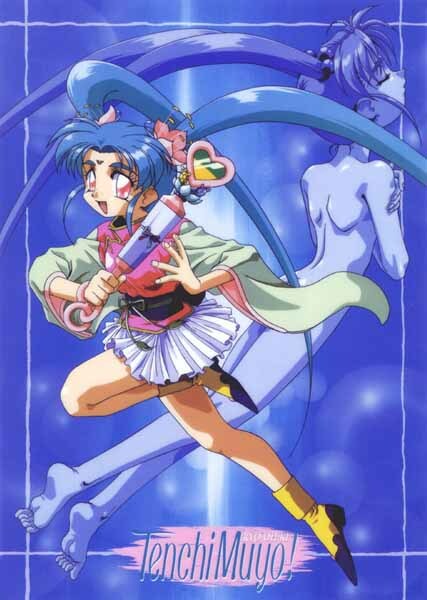 During a regular delivery call to a house, Sasami meets up with Tsunami and gets her new powers and her new friend, Ryo-Ohki. Around the same time, Ramia's tendrils have already slithered into the world and have picked Misao to become Sasami's magic girl rival. 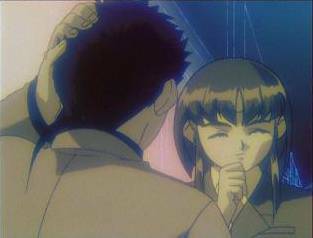 The action heats up when Ayeka and Ryoko are turned into Love-Love monsters by Pixy Misa and start fighting over Tenchi, endangering his life. Pretty Sammy ends up saving the day (technically) as she always will, and leads us into the next episode. Episode two starts off with a power hungry, psychotic, computer genius. (Bill Gates?!) His name is Bif Standard. Bif wants to 'standardize' all computers, and afterwords he wants to standardize the people who use them as well. He controls 95% of the worlds computers, except for Japan. Anyway, Ramia and Rumiya appear and try to 'help' Bif with his conquering of the world. Meanwhile, at the Kawai residence... Chihiro needs a new karoake machine. Tenchi goes out to buy one, but instead he buys a new computer, the Mach8 system. The fastest on Earth. He also goes to buy some software. Bif looks on, and realizes that it's not using his software. Bif gets really angry and calls on Pixy Misa. The above description came from Magical Girl Pretty Sammy, and was edited by yours truly (contact me).